The story lines run deep, and the best one belongs to Bradley Weiss. The 29-year-old from South Africa, once the prodigy of XTERRA Hall of Famers Conrad Stoltz and Dan Hugo, has an opportunity to do something neither of his fellow countrymen ever did – win the continental Grand Slam of XTERRA. More than 30 elites from around the world are scheduled to compete at the XTERRA Pan American / USA Championship race in Ogden, Utah next Saturday, September 15. As the culmination of a 12-stop series of off-road triathlons spanning South and Central America, Mexico, the Caribbean, Canada, and the U.S., the contenders are coming from near and far, and with $80,000 in prize money at stake and cameramen capturing all the action for a nationally broadcast one-hour TV show, the stage is set for XTERRA’s best to show what they can do. The story lines run deep in the men’s elite race, and the best one belongs to Bradley Weiss. The 29-year-old from South Africa, once the prodigy of XTERRA Hall of Famers Conrad Stoltz and Dan Hugo, has an opportunity to do something neither of his fellow countrymen ever did – win the continental Grand Slam of XTERRA. “So far in 2018 I have won the XTERRA African Champs, XTERRA Asia-Pacific Champs, as well as most recently the XTERRA European Champs, so if I could win the Pan American Champs and hold all the continental titles in one calendar year, that would be pretty special,” said Weiss. It would also be unprecedented, but to do it the reigning XTERRA World Champion will have to get past the 2016 XTERRA World Champion, Mauricio Mendez from Mexico, and the 2015 XTERRA World Champion, Josiah Middaugh from the U.S.
For Mendez, who led this race from wire-to-wire last year and posted the fastest run of the day to seal the deal, altitude is just another tool in his arsenal. He grew up in Mexico City at around 7,000-feet, so even the very top of the bike course in Utah, which peaks at 7,300-feet, is nothing out of the ordinary. Mendez has already taken his own game to the next level. 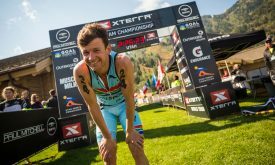 He won XTERRA Chile to open the year, then XTERRA Tahiti, and even captured an Ironman 70.3 Asia-Pacific Championship, but the most telling result was when he upset Middaugh to win the XTERRA Beaver Creek off-road triathlon in July. To best “Beast Mode Middaugh” in his own backyard is a rare feat, one that hadn’t been accomplished since Conrad “the Caveman” Stoltz did it in 2012. And speaking of Beast Mode, he may be 40-years-old but he’s as fierce as ever, despite being the nicest, most knowledgeable guy in the sport. Nice or not, the 18-year XTERRA veteran is not ready to relinquish his place on the top step. The reigning and two-time XTERRA Pan America Tour Champion and 12x XTERRA National Champ won majors at XTERRA Oak Mountain, Dominican Republic, Mexico, and Quebec this year, but it’s these next two races that really matter. For Middaugh, the key to success, although strategic, is straight forward. Outside of the big three, there are a lot of other men on the start list eager to get the job done. There’s Kieran McPherson, who is poised to win the XTERRA Pan American Tour title this year. The 26-year-old from New Zealand has proven he’s got one of the fastest runs in all of XTERRA. As proof, he chased Middaugh down to win at XTERRA Victoria. He’s also got wins at XTERRA Argentina and XTERRA Brazil, and despite being a Kiwi he’s been living and training in Colorado, so altitude is in his favor as well. Karsten Madsen, also 26, is Canada’s best, and he got the better of McPherson to win XTERRA Uruguay this year. He’s also been training with Middaugh in the Rockies, with his eye on securing his second-place position in the Pan Am Tour rankings with his best championship season yet. Then there’s the kid, Sam Long. He’s 22, even younger than Mendez, but has eye-opening power, as evidenced at XTERRA Beaver Creek where he out-paced both Mendez and Middaugh heading into the run. Those two caught him on the run, so he settled for third, but a statement was made. Other veterans of note in the race include Brian Smith, who was 6th last year, and Branden Rakita, who was 9th on the day and finished second on the XTERRA Pan Am Tour. As for Rakita, a true student of the sport, he provides this great insight on the course, competition, and his personal goals. The XTERRA Pan American Championship is a 200-point scale race for elites, so the winner will earn 200 points, second 180, and so forth. Kieran McPherson holds a near insurmountable lead atop the men’s standings heading into the finale in Utah. To secure the Tour title he needs to finish 13th or better. Karsten Madsen, who sits in second with 579 points, would top out at 779 points with a win. McPherson, with a 13th place finish, would end up with 781. Josiah Middaugh, the reigning and two-time XTERRA Pan Am Tour champ, is just five points behind Madsen and in position to take advantage of any miscues from McPherson or Madsen ahead of him. In the women’s elite race all eyes are on the Scottish Rocket, Lesley Paterson. Her credentials tell you why. She won here last year, and three times total. She’s a two-time XTERRA World Champ, the reigning and two-time ITU Cross Tri World Champ, and won both U.S. stops on the Pan Am Tour this year at Oak Mountain and Beaver Creek. She’s also a model, film producer, coach, and wrote the book on the mental game in this sport; The Brave Athlete: Calm the F*ck Down and Rise to the Occasion. While odds are Paterson makes her move early and never looks back, America’s Julie Baker has proven she belongs and led this race through the first five miles of the bike last year. Reigning XTERRA Pan Am Tour Champ Suzie Snyder is also hoping to put in a good effort, despite spending the season recovering from injury. “I am planning on racing in Utah, but a little frustrated that the fitness isn’t where I had hoped to be,” she said. Fitness is a huge part of the challenge in Utah. The race starts with a one-mile swim in Pineview Reservoir (4,900-feet elevation), follows with an 18-mile mountain bike leg that climbs more than 3,000-feet to the top of Sardine Peak (7,300-feet elevation) and culminates with a 7-mile trail run featuring another 700-feet of climbing on trails around Snowbasin Resort in the Wasatch Range. The course, they say, is best-suited for mountain goats. The story-within-the-story for the women’s race is the chase for the XTERRA Pan American Tour title. Mexico’s Fabiola Corona sits on top the standings with 604 points, but Kara LaPoint is just 34 points behind in second. “This is the big event, so all the best athletes will be there, and we will fight with all we have left. I know the race venue, I raced there in 2010, so I know what to expect. It is a hard course but a beautiful place, I like it in Utah even though it will cause us pain and make us suffer,” said Corona, who has notched wins at XTERRA Argentina, Dominican Republic, Mexico, and Quebec so far this year. For LaPoint, who did eight races across the Americas this season, the opportunity to travel, race, and experience the Tour was equally as rewarding. Other contenders in the women’s elite race include Allison Baca, who won at XTERRA Chile in March then spent the rest of her spring recovering from injury. Katie Button, who sits in eighth place in the Tour standings, can move up considerably with a strong day in Utah. The wild card in the women’s race is Magali Tisseyre, who has won 17 Ironman 70.3 races in her illustrious road triathlon career. She finished sixth at XTERRA Worlds back in 2012 and says she’s ready to give off-road another go. Find elite race updates on twitter @xterraoffroad starting at 9am MST on September 15, and view images and videos in the build-up on Facebook.com/XTERRAplanet.